Bleaching your hair can be done for a variety of reasons. Perhaps you want to be blond, but were born brunette. You may want to dye your hair an electric shade of blue, but need to lighten the tint so that you can achieve the full shock value. Or you may just want to put highlights in, to create a summery, sun-kissed look to brighten your locks. Hair bleaching agents are generally comprised of one of the two following ingredients: hydrogen peroxide or ammonia persulfate. These ingredients penetrate the hair follicle to the melanin at the core. The melanin is what gives your hair its natural color. When these bleaching agents reach your melanin, they remove the color, leaving it white. If you have a darker color of hair to begin with, your hair will pass through several stages of color before reaching the desired pale white. These stages include red, orange, yellow and then pale blonde. 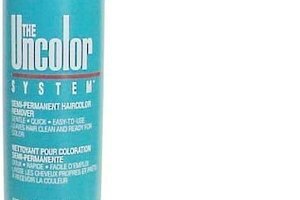 Hair bleaching can be accomplished with a bleach kit that includes a bleach powder and liquid ammonia or, if your hair is relatively light to begin with, a pale blonde hair dye kit. The amount of time that you will want to leave the bleach mixture in your hair varies by person. You must take into account the final color that you would like your hair to be bleached to, the condition of your hair and your starting color. If your goal is not stark white, then you will need to leave the mixture in for less time than is otherwise recommended to achieve that color. If your hair is brittle, dry or extremely damaged, you will want to use utmost caution when bleaching it. Hair bleach strips the hair follicle, leaving it much more prone to breakage and dryness. If your hair has been chemically damaged it is recommended that you go to a salon instead of bleaching it yourself at home. And if your starting color is dark, you will require more time to achieve the desired color. A strand test is highly recommended 24 hours before you attempt to bleach your hair. This will accurately tell you how long the bleach needs to stay on to properly lighten your hair. The recommended amount of time to wait between bleach treatments for your hair varies by person. Depending on how fast your hair grows, many colorists recommend a touch-up every four to six weeks. As a general rule of thumb, you will want to re-bleach your hair once you have an inch of new hair growth, as the contrast is usually not very pretty. However, you will want to be careful to bleach only the new growth, as bleaching the previously bleached hair can cause your hair to become very damaged. Bleaching your hair too frequently or leaving the bleach on your hair for longer than is necessary can lead to a host of problems. The bleach naturally dries your hair out, leaving it in a weaker condition than before. Frequent bleaching can leave your hair prone to breaking off, or in extreme conditions, falling out. It is important to wait the recommended four to six weeks between bleaching so as to not overwhelm your hair and allow it time to recover. Although you cannot undo the damage done to your hair after bleaching it, there are things you can do to improve its condition and minimize the negative effects. First, invest in a deep-conditioning product for dry, damaged and processed hair and use it daily. Make sure that your shampoo is also formulated to protect damaged hair. Weekly hot oil treatments can do wonders for putting some life back into your hair. And finally, trimming your hair regularly will keep it looking great. Noel Stanchfield is a travel, health and beauty writer. She has been writing from firsthand experience since 2004, contributing to various online publications.